It's important to get some perspective on recent declines. Investing booms often lead to busts, and for recent investors in marijuana stocks, October felt like a rude awakening. Even though investors had looked forward to the legalization of recreational cannabis in Canada, a big plunge in the broader market brought about a downturn that sent key marijuana stocks plunging. Yet in the course of evaluating a stock portfolio, it's important not to let short-term results have too much influence over your long-term vision. One way to avoid letting your emotions get the better of you is to realize that even after a big pullback, those who've been committed to a particular investment often still end up ahead. That's been true for key players in the cannabis industry, and it's far more important to look at the fundamental performance of companies than at share-price fluctuations in deciding whether to hang on to a particular stock or move on to greener pastures. 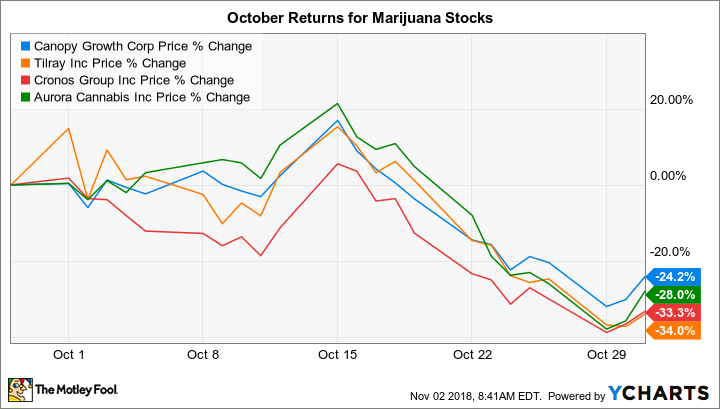 October was definitely not a good time for stocks in the marijuana industry. Excitement about the imminent opening of the Canadian cannabis market helped to sustain momentum for major players like Canopy Growth (NYSE:CGC) and Cronos Group (NASDAQ:CRON), and the recent IPO of Tilray (NASDAQ:TLRY) continued to draw attention because of the stock's extreme volatility. Many investors looked to the mid-month listing of Aurora Cannabis (NYSE:ACB) on the New York Stock Exchange as a potentially momentous occasion that would drive further gains for marijuana stocks. But the combination of a broader market correction and a "sell the news" mentality after cannabis became legal in Canada led to dramatic declines. All four stocks ended the month down by roughly a quarter to a third. The magnitude of the declines came as a huge shock to investors in the space, especially those who were new to the industry and had bought shares late in the upward part of marijuana's rising market cycle. Just as quickly as bulls had embraced the marijuana movement during the run higher, skeptics flooded in to declare an end to the cannabis craze for good. 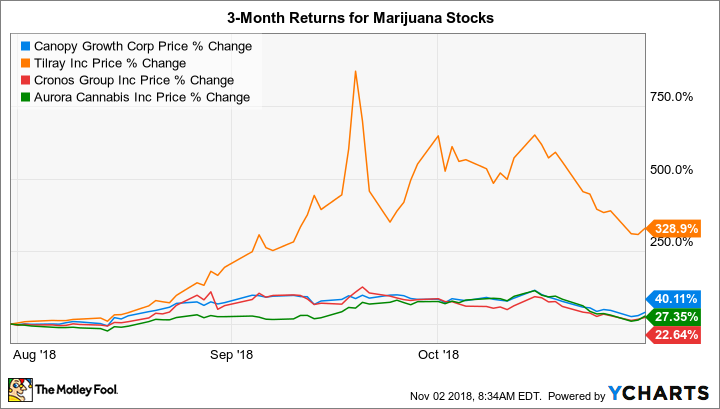 As you can see, the huge gains that marijuana stocks posted in August and September leading up to the historic opening of the Canadian cannabis market were more than enough to offset the declines that resulted in October. All told, Tilray stock more than quadrupled over the three-month period even taking its recent plunge into account, and healthy gains of 20% to 40% for Canopy Growth, Aurora Cannabis, and Cronos Group showed that even a major decline wasn't enough to dispel investor awareness of the huge potential for long-term growth from marijuana. There'll inevitably be plenty more ups and downs for marijuana stocks in the months and years to come. As important as Canada's move to legalize recreational pot was, it's just a drop in the bucket compared to the global potential in the industry. As more U.S. states make moves toward legalization and the federal government contemplates whether to lift its own restrictions on marijuana, investors will have to deal with plenty of volatility as sentiment waxes and wanes. Along the way, some marijuana companies will assume leadership roles in the industry, while others will make mistakes that cause them to fall out of favor and give way to new up-and-coming players in the field. The declines that Canopy, Aurora, Cronos, and Tilray suffered in October were painful for shareholders, but they won't define the future of the cannabis industry. Smart marijuana investors have to stay focused on fundamental metrics like sales and income in evaluating which stocks will fade into the background over time -- and which will produce the top returns in the cannabis sector in the long run.